We've super-sized our Alumni Weekend offerings in celebration of UBC Science's 50th anniversary. Free admission to our museums, documentary screenings, bug crawls (really), open houses, exclusive panel sessions for Science alumni, and more. This May 25, there's something for everyone. Discover UBC's natural history collections at the Beaty Biodiversity Museum and explore Canada’s oldest university botanical garden, rain or shine! Chris Waltham will reveal how to use a little science to make greener and better life decisions. Celebrate biodiversity at the Beaty Biodiversity Museum with family programming, tours, and museum activities. Google founding investor David Cheriton, entrepreneur Ross Beaty and fellow panelists discuss spotting value in ideas. 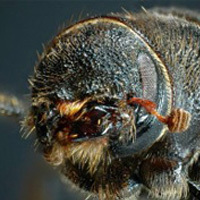 Researchers at UBC and Canada’s Michael Smith Genome Sciences Centre have decoded the genome of the pine beetle, only the second beetle genome ever sequenced. The genome revealed large variation among individuals of the species, a diversity which could allow them to be more successful in new environments. “Sequencing the mountain pine beetle genome provides new information that can be used to help manage the epidemic in the future,” says Christopher Keeling, a researcher at UBC’s Michael Smith Laboratories. Cthulhu, a gigantic science fiction monster conceived by American horror writer HP Lovecraft in 1926. Cthulhu macrofasciculumque, a protist recently discovered living in the gut of termites by UBC microbiologists. A video of the real Cthulhu uploaded to our YouTube channel has received more than 10,000 views. UBC alum Gregg Saretsky (BSc Microbiology-Biochemistry, 1982 | MBA, 1984) has been named Alberta’s 2012 Business Person of the Year by Alberta Venture magazine. 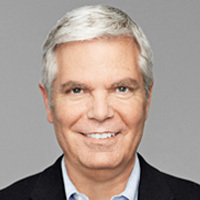 Saretsky is president and CEO of Westjet Airlines. Airplanes have been a long-time passion of this Montreal-born alum: His father was director of flight services for Air Canada, his two older brothers worked as commercial pilots. Saretsky began his airline career as a flight attendant for Air Canada. 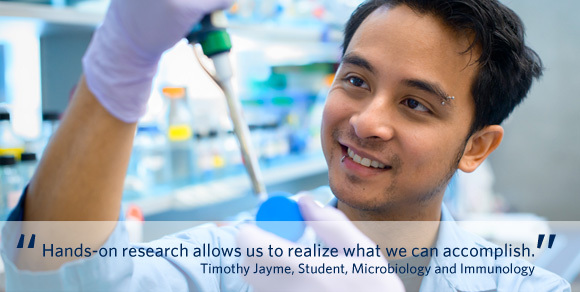 Research experience brings learning to life, translates theory to the working world, builds confidence, and allows students to develop a supportive relationship with a mentor. But not enough students have a chance to conduct research at the undergraduate level. In celebration of the Faculty of Science’s 50th anniversary, we've launched the Science Undergraduate Research Experience (SURE) initiative. SURE will raise funds to support students interested in conducting summer research. The Dean of Science has committed up to $100,000 in matching funds, meaning your donation to SURE is instantly doubled. Zoologist Sarah Otto has been elected to the National Academy of Sciences, an 150-year-old society charged with providing independent, objective advice to American policy makers on matters related to science and technology. Three UBC Science researchers have received Human Frontier Science Program grants. Filip van Petegem (Biochemistry and Molecular Biology), Douglas Altshuler (Zoology) and Nobuhiko Tokuriki (Michael Smith Laboratories) will use the grants to collaborate with scientists in other countries. Computer scientist Joanna McGrenere has won a Microsoft Research Software Engineering Innovation Foundation award for her proposal on making touch-based devices easier to use for people of all ages. Neil Balmforth, director of UBC’s Institute of Applied Mathematics, has been awarded the 2013 Development and Maintenance of Applied and Industrial Mathematics in Canada Research Prize for his work on modeling issues associated with complex fluids. Tired of paper? Read our digital edition of Synergy, complete with interactive content and perfect for viewing on your tablet or computer. 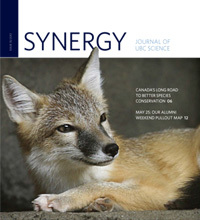 Sign up to receive future copies of Synergy electronically, and help us cut paper copies and shipping costs.